My Church Telephone System Installation. 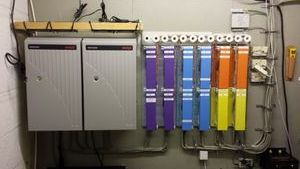 Paul's Merlin Magix Telephone System Installation. This is a picture of the Avaya Merlin Magix telephone system that I installed for my church. The Merlin Magix is a digital telephone system that was created by Bell Labs for Lucent Technologies, a company that was once a part of Western Electric (the manufacturing arm of the Bell System "Ma Bell"). The company known as Avaya is the former Business Communications unit of Lucent. This installation consists of the main carrier and one expansion carrier. The Merlin Magix can support up to two expansion carriers. Most of the cabling used in this installation is CMP or Plenum rated. CMP is more expensive than CMR or Riser rated cable, but it can be used for most inside wiring situations. Note: As it pertains to telephone systems, I am an end user. For more than 23 years, I worked as a Central Office technician for an IXC/CLEC (before being laid off). As such, I did not work with this type of hardware. I do not try to pass myself off as a CPE installer. This project is something I did for the church I attend. All time & materials is donated. I've tried to make the installation as "correct" as possible without having been trained in proper cabling techniques or having access to some of the tools that installers would need to do a completely textbook install. A huge "Thank You" to Ed Vaughn for providing me with several of the colored backboards, Suttle jacks & 66 blocks used in this installation. I am also deeply indebted to Touch Tone Tommy (aka TTT) for his guidance, support and patience with me over the years. Without his expertise, the Merlin Magix and backup Partner ACS systems would never have been installed. I also want to give special mention to Jack M. (aka Merlinman). As a retired Tier III support tech for AT&T/Lucent/Avaya, Jack's knowledge of the Merlin platform has no equal.